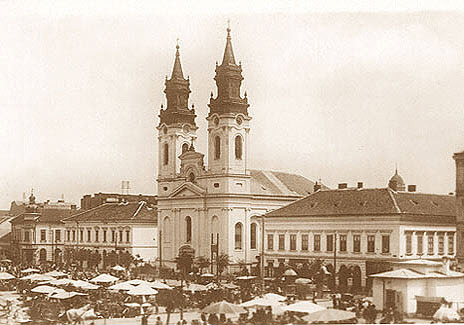 After many written requests coming from the Orthodox hierarchs, especially from the metropolitan of Karlovitz, “by the order of the emperor at 1 November 1822 clerical schools will be opened in the dioceses of Arad, Timişoara and Vârşeţ, organized following the example of those in Karlovitz and Pacratz”. The big news spread fast in all the Arad Bishopric, because it was communicated by the bishop Iosif Putnic, the holder of the bishop throne in Arad. The echo of this news was remarkable because in the first series of classes 68 young have registred. The first teachers of The Theological Institute were: Gavril Raţ and Gavril Giuliani, considered at that time to be the most prepared priests from Arad area. The school year 1832-1824 has registered 49 pupils, and in the second year remained 31, the others left the school for different reasons. So, totally 80 pupils were included in the school year. 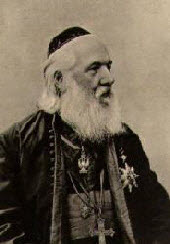 Gavriil Gherasim Raţ managed the Institute until the end of first semester of 1834-1835 school year because he was appointed bishop in Arad, as the first Romanian bishop. He was ordinated bishop at the feast of Evangeline 1835, but the official installation took place in the 8th of April. His place at the Institute was taken by Dimitrie Iacobescu. At the beginning of 1835-1836 school year Gavril Giuliani leaves the Institute, too, being appointed archpriest of Buteni. The abbot from Hodoş-Bodrog monastery, Grigorie Chirilovici, took Giuliani’s place after he had left. This time therte were brought as teachers of the Institute the following priests: Petru Varga and Petru Popovici. They will remain teachers until 1839. Beging with 1839-1840 school year the Institute enters a higher level because there are brought two young teachers with a lot of apostolic goodwill: the archdeacon Patrichie Popescu and monk-deacon Ghenadie Popescu. In 1843 bishop Gherasim Raţ appointed as Vlach grammar teacher the priest from Sâmbăteni, Ioan Raţ. Patrichie Popescu is called in 1844 in Karlovitz “damaging the Istitute and Romanian interests”. The institute will be lead by Ghenadie Popescu and as teacher in Patrichie Popescu’s place will be appointed Arsenie Popovici. Other important cultural and spiritual Romanian personalities worked at the institute: Roman Ciorogariu, Iosif Goldis, Aron – Augustin Hamsea, Vasile Mangra, Iustin Suciu, Teodor Botis, Iosif Iuliu Olariu a. o. In the middle of XIXth century, the local Institute passes through an important crisis. That fact forced the local bishop Ioan Metianu to appeal the leadership of Church for the recovery of Romanian schools especially The Theological Institute. Bishop Mentianu took some personal conclusions: “in order to rise the education first of all we are in need of illuminated teachers, priests, real apostles of our believers and for their spiritual growing we are in desparate need of a good Institute”. Aron Hamsea: in first class, Pedagogical sciences, in the second class Dogmatic Theology and in the third class Moral Theology and Canonical Law. Vasile Mangra: in first class Romanian Literature and Grammar, in second class Rhetoric and Christian History. Ignatie Papp: Hermineutical, Pastoral. Ritual and Ecclesiastical music were taught by Petru Popovici. Bishop Ioan Metianu sent some young students abroad. For example, Roman Ciorogariu was sent in Germany and Ioan Trailescu was sent to Cernauti. Coming back from the studies those young have been the promoters of improving the activity and renewing the Istitute. 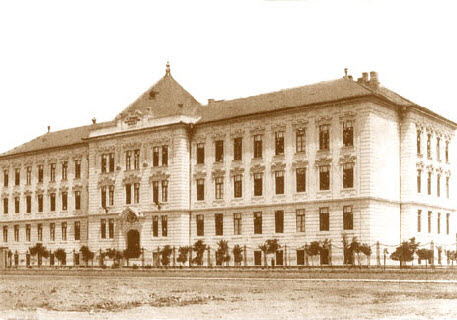 Since 1927-1928 school year , The Theological Institute from Arad, is elevated, by the decision no. 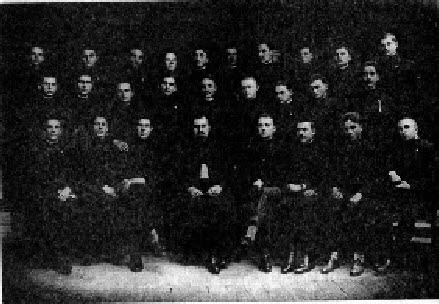 60/1927 of bishopric assembly , during Bishop’ s Dr. Grigorie Comşa espicopate, at the level of Theological Academy, being reorganized with four classes. 1927 marks the beginning of a new era in the theological Arad school’s life. Unfortunately in 1948 the communist leaders dissolved this venerable place of faith, culture and Christian –Romanian spirituality. In its very beginning, the Theological Institute didn’t have its own location. The classes were held in different houses, rented, near the Mures riverside, where the old cathedral, was demolished in 1861. The priesthood and intelligentsia from Arad desired to have an own location for the Institute. So “ parish assembly from Arad asked the Synod a loan in 1873 for buying a building near the Church, which will be the location of the Theological Institute”. In 1875 it has been started the construction of this building near the Cathedral Church. Bishop Ioan Metianu sent a letter to all the priests, archpriests and teachers; through this message His Eminence claimed that everyone should bring his help in finishing the school construction. This claime had a good result and the building was finished in a record time. That is why the 1876-1877 school year stared in the new location. The Theological School in Arad had its location here as a Theological Institute and as a Theological Academy from the year 1927-1948, headed by leading figures of the Romanian Church and culture of that time: Dr. Teodor Botis, Nicolae Popovici, Dr. Ilarion V. Felea, the last rector of the Theological Academy. We said last rector because in the year 1948 the voice of this school was silenced and its gates were closed, after its impact with the atheist leadership from Romania. This school remained closed untills the 1989 Revolution. After a silence of over four decades, the theological school from Arad resurected in the autumn of 1991 as a Faculty of Theology, inside the University “Aurel Vlaicu”. 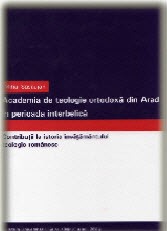 This Faculty is considered to be the sequel of the academical theological edication from Arad, which has its roots in the Preparandia of Arad (1812) and in The Theological Institute (1822) and also in the Theological Academy. This was possible because after1989 many people of the culture have made many memories and have taken several steps to recall to life the fundamental institutions of the community. 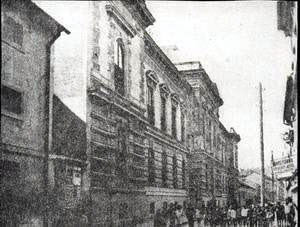 In the first year of existence, 1991-1992 school year, classes were held in the current location of the medical school, and in the autumn of 1992 and consequently from the 1992-1993 school year the Faculty of Theology has been moved on Dragalina street, no. 28, where there was enough space for classes, seminaries and offices until 1996. In the autumn of 1996 in a solemn way the theological faculty has been moved in the current place which was intended by the founders. This was not easy, requiring many steps and even a protest of teachers and students, scholars, headed by His Eminence Bishop Timotei Seviciu, on the 8 to 9 January 1996. După multe tatonări şi repetate solicitări scrise din partea ierarhilor ortodocşi şi în special din partea mitropolitului de Karlovitz „prin rezoluţie împărătească, se dispune ca la 1 noiembrie 1822 să se deschidă şcoli clericale în eparhiile Arad, Timişoara şi Vârseţ, organizate după modelul celor din Karlovitz şi Pacratz”. Vestea aceasta mare s-a răspândit rapid în întreaga Episcopie a Aradului, în urma comunicării ei de către episcopul losif Putnic, administratorul diocezei ortodoxe a Aradului. Ecoul acestei veşti a fost remarcabil, dacă din primul curs s-au înscris 68 de tineri. Primii profesori ai Institutului Teologic au fost: Gavril Raţ şi Gavril Giuliani, consideraţi în epoca aceea a fi cei mai bine pregătiţi clerici din părţile Aradului. În anul şcolar 1823-1824 s-au înscris în anul I 49 de tineri, iar în anul al II-lea de studii au mai rămas doar 31, ceilalţi părăsind şcoala din motive diferite. Deci, în total au fost incluşi în procesul de învăţământ în acel an şcolar 80 de elevi. Gavril Gherasim Raţ s-a aflat în fruntea Institutului până la sfârşitul semestrului I al anului şcolar 1834-1835, întrucât acum au fost încununate de succes eforturile românilor arădeni de a avea în fruntea lor un episcop român; acesta a fost profesorul Gavril Gherasim Raţ. El a fost hirotonit întru episcop la sărbătoarea Buneivestiri din anul 1835, iar în ziua de 8 aprilie a fost instalat. În locul lui Gavril Raţ, la Institut, a fost numit Dimitrie lacobescu. La începutul anului şcolar 1835-1836 părăseşte catedra Institutului şi Gavril Giuliani, ajungând protopop de Buteni. Conducerea Institutului a fost încredinţată după plecarea lui Giuliani, administratorului mănăstirii Hodoş-Bodrog, Grigorie Chirilovici. În acest timp au mai fost aduşi ca profesori la Institut şi următorii preoţi: Petru Varga şi Petru Popovici. 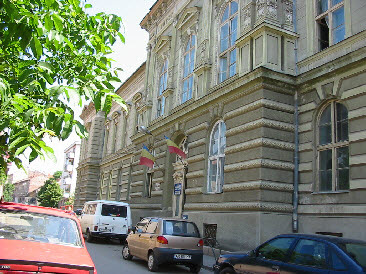 Aceştia vor rămâne profesori la Institut până la sfârşitul anului şcolar 1838-1839. Începând cu anul şcolar 1839-1840, Institutul intră într-o etapă calitativ-superioară, prin faptul că sunt aduşi doi tineri profesori cu mult zel apostolesc: protodiaconul Patrichie Popescu şi ierodiaconul Ghenadie Popescu. În anul 1843-1844, episcopul Gherasim Raţ 1-a numit ca profesor de „Gramatică valahă”, pe Ioan Raţ, parohul din Sâmbăteni. În anul 1844, Patrichie Popescu este chemat la Karlovitz „spre dauna Institutului şi a intereselor româneşti”. Treburile Institutului sunt conduse de Ghenadie Popescu, iar ca profesor în locul lui Patrichie Popescu a fost adus preotul Arsenie Popovici. La Institutul Teologic arădean au mai funcţionat ca profesori şi alte personalităţi ale culturii şi spiritualităţii româneşti, multe dintre ele foarte cunoscute: Roman Ciorogariu, losif Goldiş, Aron – Augustin Hamsea, Vasile Mangra, Iustin Suciu, Teodor Botiş, Iosif Iuliu Olariu s.a.
Pe la mijlocul veacului al XlX-lea, Institutul Teologic din Arad trece printr-o mare criză. Acest lucru 1-a determinat pe episcopul locului de atunci – Ioan Meţianu să facă apel în cadrul organelor de conducere bisericească pentru redresarea şcolilor româneşti, în general şi a acestui Institut în special. Episcopul Meţianu a ajuns la unele constatări personale: pentru „ridicarea învăţământului, mai înainte de toate avem trebuinţă de organe luminate, de preoţi şi învăţători luminaţi, de adevăraţi apostoli ai credincioşilor noştri, iar pentru creşterea acestora avem neaparată trebuinţă de un Institut bun de creştere şi pregătire, înţeleg de un Institut Pedagogic-Teologic, după cerinţele timpului şi după trebuinţele noastre…”. Urmând cu tenacitate cele afirmate la Sinod, episcopul Meţianu întreprinde cele necesare pentru reorganizarea şi consolidarea Institutului şi, în primul rând se îngrijeşte de cadrele didactice corespunzătoare unui proces de învăţământ la nivelul dorinţelor sale. Se impune o muncă asiduă de regenerare a Institutului, în acest context, el era preocupat de creşterea unei generaţii care să fie la înălţimea chemării lor. 1. Aron Hamsea: în cursul I Ştiinţele pedagogice, în cursul al II-lea Teologia dogmatică, în cursul al III-lea Teologia morală şi Dreptul canonic. 2. Vasile Mangra: în cursul I: Limba şi literatura română şi exerciţiile gramaticale, în cursul al II-lea Retorica şi Istoria bisericească. 3. Ignatie Papp: în cursul I Ermineutica, în cursul al II-lea Pastorala. Tipicul şi cântarea bisericească au fost predate de Petru Popovici. Episcopul Ioan Meţianu se îngrijeşte de trimiterea de tineri peste hotare, în vederea pregătirii lor temeinice cu scopul de a sluji Institutul Teologic din Arad. De exemplu, Roman Ciorogariu este trimis în Germania, iar mai apoi Ioan Trăilescu la Cernăuţi. Întorşi de la studiu, aceştia şi alţi tineri au fost promotorii înnoirii şi dinamizării activităţii Institutului Teologic pe toate planurile. Începând cu anul 1927-1928, Institutul Teologic din Arad este ridicat, prin hotărârea nr. 60/1927 a Adunării eparhiale, în timpul păstoririi episcopului Dr. Grigorie Comşa, la rangul de Academie Teologică, reorganizându-se cu patru ani de studii. 12 Anul 1927 marchează începerea unei noi etape în viaţa şcolii teologice arădene, fiind vorba nu numai de o înaintare în timp, ci şi de un urcuş calitativ în devenirea sa. Din păcate, numai până în anul 1948, când regimul comunist a desfiinţat acest venerabil aşezământ de credinţă, cultură şi spiritualitate creştina şi românească. La începutul existentei sale, Institutul Teologic nu-şi avea un local al lui propriu. El funcţiona în diferite case, pe care le închiria, aflate în zona malului Mureşului, în apropierea fostei catedrale, dărâmată în 1861. Preoţimea şi intelectualitatea arădeană se frământa pentru a putea să aibă o clădire proprie pentru Institutul Teologic. Astfel, „comitetul parohial din Arad, înainta o rugare sinodului din 1873, pentru un împrumut din fondurile diecezanei, spre scopul edificării unei case comune lângă Biserica, care să servească de local Institutului pedagogic-teologic”. În anul 1875 a început zidirea acestei clădiri, din zona catedralei. Episcopul Ioan Meţianu a trimis o circulară în acest sens, adresată tuturor preoţilor, protopopilor şi învăţătorilor, prin care îi îndemna să-şi aducă fiecare obolul său pentru luminarea oamenilor. Apelul ierarhului arădean a avut ecoul dorit în sufletul păstoriţilor săi, iar clădirea a putut fi terminată într-un timp record, aşa încât anul şcolar 1876-1877 a putut să înceapă în noul local. Şcoala teologică de la Arad a funcţionat aici sub formă de Institut teologic şi apoi Academie teologică din anul 1927-1948, având în frunte personalităţi marcante ale Bisericii şi culturii româneşti din acea vreme: Dr. Teodor Botiş, Nicolae Popovici şi pe ultimul rector al Academiei teologice, Dr. Ilarion V. Felea. Am spus ultimul rector, deoarece anul 1948 a fost anul când vocea acestei şcoli a amuţit iar porţile ei s-au închis, în urma impactului ei cu regimul acultural şi atotstăpânitor, până în 1989. Rechemarea la viaţă a unei tradiţii bisericeşti şi culturale teologice de secole. După o întrerupere de peste patru decenii, şcoala teologică de la Arad reînvie sub forma unei Facultăţi de Teologie, în cadrul Universităţii „Aurel Vlaicu”, în toamna anului 1991, ca reînnodare a firului tradiţiei învăţământului teologic academic din Arad, ce îşi are rădăcinile în Preparandia Arădeană (1812) şi Institutul Teologic (1822), respectiv Academia Teologică. Aceasta a fost posibil după 1989, când mai mulţi oameni de cultură şi cu dragoste faţă de instituţiile fundamentale ale comunităţii, au întocmit mai multe memorii şi au întreprins repetate demersuri pentru rechemarea la viaţă a acestei instituţii. În primul an de existenţă a Facultăţii de Teologie, respectiv în anul universitar 1991-1992, cursurile s-au ţinut în localul actualului Liceu Sanitar, vis-a-vis de Prefectură, iar în toamna anului 1992 şi implicit din anul universitar 1992-1993, Facultatea de Teologie s-a mutat pe strada Dragalina, nr. 28, unde a avut la dispoziţie suficiente spaţii pentru cursuri, seminarii şi birouri, până în 1996. Căci, în toamna anului 1996 – şi noul an universitar 1996-1997, într-un cadru solemn, a avut loc mutarea şcolii teologice universitare, în localul care i se cuvine şi pe care i l-au destinat ctitorii lui. Acest lucru nu a fost simplu, fiind necesare multe demersuri şi chiar un miting de protest al cadrelor didactice şi studenţilor teologi, în frunte cu P.S. Episcop Timotei, în ziua de 8-9 ianuarie 1996.